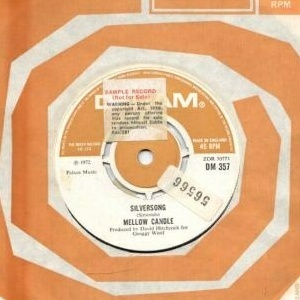 Mellow Candle began life as three schoolgirls, Clodagh Simonds, Alison O'Donnell (later Williams) and Maria White, originally known as The Gatecrashers. Exasperated at not being taken seriously at home, they sent a demo tape to Radio Luxembourg DJ Colin Nicol. 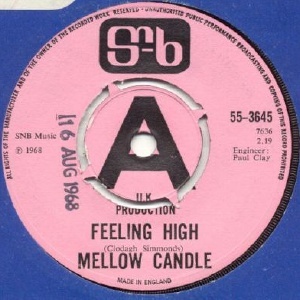 This led to a one-off single deal with SNB Records, the label of former Yardbirds manager Simon Napier-Bell, distributed by CBS. 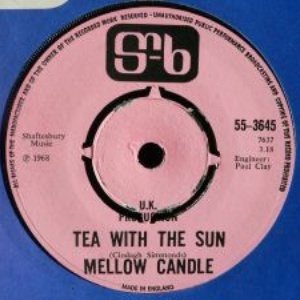 The delightful "Feeling High" / "Tea With The Sun" was well received but didn't trouble the charts, SNB not being ideally placed for breaking a new artist, it must be said. 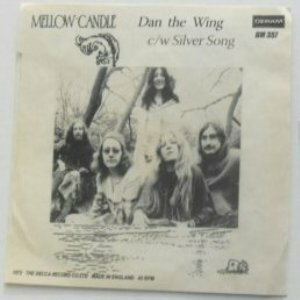 The band was on hold for a year or two while the girls left school and pursued different options but by 1970 Clodagh & Alison were rehearsing again as Mellow Candle, now a drummerless folk-rock quartet with Dave Williams (guitar) and Pat Morris (bass). Their material was complex and intricate and imaginatively arranged, featuring strong vocal harmonies from the two girls. They slowly made inroads into the Dublin scene. Ted Carroll became their manager. They made their live debut at Liberty Hall supporting The Chieftains in 1970. 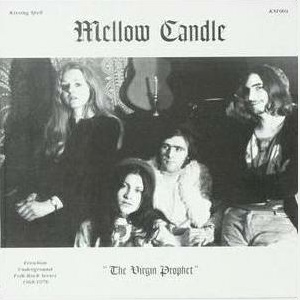 Previously unreleased demo recordings from this period (1969-1970) were released on the Kissing Spell label as "The Virgin Prophet". In 1971 Pat Morris left and was replaced by Frank Boylan (ex Creatures) on bass and drummer William Murray. Murray was from Glasgow and had previously played with Kevin Ayers. Pat Morris later turned up in Under River. With a proper rhythm section underpinning it, the music became more robust. The band relocated to London but continued to play regular gigs in Ireland including several notable festivals such as The 1971 Headland Festival at the RDS (Alan Price, Georgie Fame, Arthur Brown's Kingdom Come) and the 1971 Wexford Festival (Fairport Convention, Tír na nÓg) and played support to Genesis, Thin Lizzy (also managed by Ted Carroll), Donovan and Steeleye Span (at the National Stadium, Dublin on June 26 1971) among others. The band was signed by Deram Records. 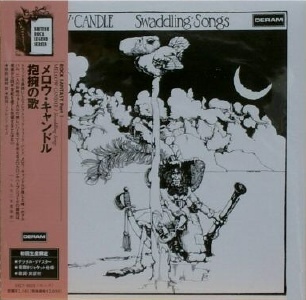 In December 1971 they recorded their debut album "Swaddling Songs" at Decca Studios in Tollington Park in London with producer David Hitchcock. 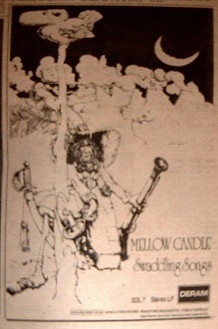 Mellow Candle played the Foxrock Folk Club on 20 February 1972. The Foxrock Folk Club gigs were regularly recorded on reel-to-reel but it is not yet known if this particular gig was recorded. 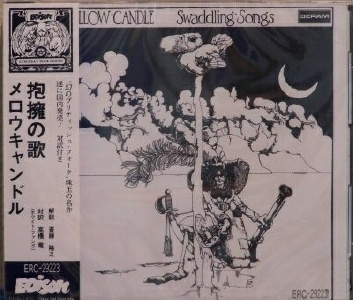 "Swaddling Songs" was released in April 1972. For some reason, it was poorly received in some circles, something that seems incredible now. The reviewer in the NME was reputedly so incredulous at its contents that he referred to it as a tax loss (note I have not actually seen this for myself, so this story may be apocryphal). For whatever reason, it simply did not sell. Much has been written about this album in the last few years. Suffice it to say that it is a masterpiece, one of the best progressive folk records ever made. Despite Ted Carroll's efforts the band weren't making much headway. Following the disappointing reaction to the album, Frank Boylan left the band and returned to Dublin. His replacement was Steve Borrill of Spirogyra, another folkrock band who made little headway though they did manage to record three LPs. 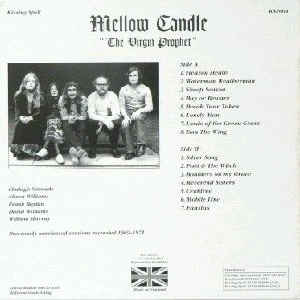 Mellow Candle changed their name to Grace Before Space around October 1972 and continued into 1973 before finally disbanding. Clodagh Simonds turned up on Thin Lizzy's Shades of a Blue Orphanage (1972), and appears on Mike Oldfield's Hergest Ridge (1974), Ommadawn (1975) and Amarok (1990) albums, as well as Jade Warriors' Kites (1976). I've read that she worked for Richard Branson/Virgin Records, including the US office of Virgin in New York in the early 80s where she and William Murray formed a band called The Same who were unrecorded. Otherwise she seemed to disappear until a solo CD appeared in 1997. "Six Elementary Songs" was recorded a year earlier in 1996 and released on the Japanese Evangel label. Since then she's made guest appearances on several recordings (including Current 93) and began her own project Fovea Hex. Alison & David Williams moved to South Africa where David worked for the South African Broadcading Service. They recorded as Flibberigibbet. Both were very active in the local scene. Alison has continued to perform with various groups and recorded sporadically. See her website for full details. Frank Boylan joined the Gary Moore Band, a trio with drummer Pearse Kelly. They did two mini tours in the UK in May and July 1972. Frank appears on some tracks on the Grinding Stone LP (CBS Records, 1973). The rest feature his replacement John Curtis, who joined during 1973. In September 1973 Frank was reportedly collaborating in new group with Philip Donnelly. He later became interested in computers. He's played on and off with several Dublin bands, including the recently reformed Creatures. William Murray did session work for several artists including Sandy Denny and Richard & Linda Thompson. 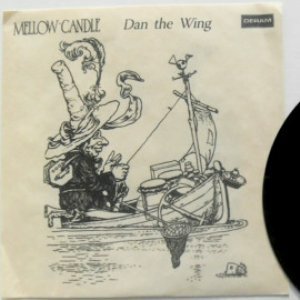 In the 80s while working for Virgin Records he and Clodagh Simonds formed a band called The Same who were popular in New York but never recorded. While in New York Murray began a successful career as a fashion photographer. He died in Ireland in 1998. 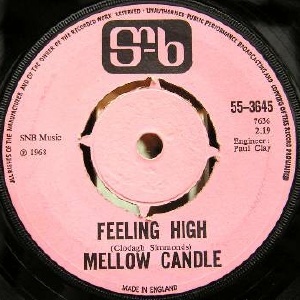 Recorded in London in 1968 with a full orchestra; backing vocals Cliff Richards' backing singers by The Breakaways. Notes: An Irish pressing may exist but we have yet to see a copy. 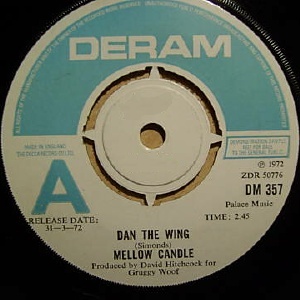 A picture sleeve was printed in Ireland, probably intended for the Irish market only and probably promo only, though they housed UK stock copies of the single. This sleeve is extremely scarce. It has the same photo on the front and back cover. The only text is the band name. There is no record company logo. It was probably initiated by Ted Carroll. 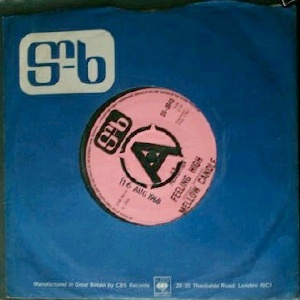 A number of sleeves may have been sent to the London office of Deram, as happened with Think Lizzy's "New Day" sleeve. 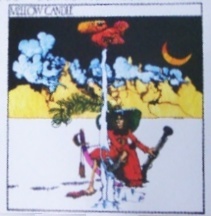 A second sleeve design surfaced on ebay in 2010, but there is some doubt about it's authenticity. Neither Alison nor Clodagh remember it. The story goes that it was sent by the Dublin office of Decca Records to a part-time Dublin journalist who'd requested a review copy of "Swaddling Songs". Why they would send him this and not the Ted Carroll sleeve is puzzling. The rear of the sleeve says Made In England. LP - ACME Gramophone Company - ADLP1040 - UK - 2004 - bootleg? 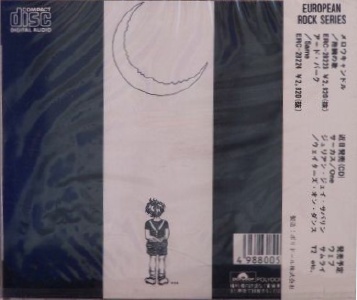 CD - Deram/Edison Records - ERC 29233 - Japan - 1993? - with obi "European ROck series"
CD - Polydor Records - POCD-1903 - Japan - 1994? CD - Si-Wan Records - ??? - Korea - 199? CD - Universal Records - UICY-9033 - Japan - 27 December 2000 - mini card LP replica sleeve with obi "British Rock Legend series"
From being one of the rarest major label albums of the 1970s, "Swaddling Songs" is now regularly in print on a myriad of different labels. Unfortunately many of these are best avoided. The only vinyl edition worth considering is a Deram original or the Si-Wan reissue. The best sounding CD editions are the early Japanese editions on Edison and Polydor, and the Korean Si-Wan edition. All three have the exact same mastering. The UK See For Miles edition is also recommended. More recent CD editions are problematic, including the Japanese replica sleeve editions on Universal. These suffer from too much compression. Ignore the SHM "Super High Material" hype and seek out an earlier edition. CD - Kissing Spell/Erewhon Records - ??? - UK - 199? Previously unreleased sessions recorded 1969-1970.